It’s almost mid September, and for every self-respecting, semi-literate Germanophilic Baltimoron — like myself — that can only mean one thing: It’s time to celebrate not one but two holidays: Der Tag and Oktoberfest. The latter, of course, is a wildly popular, mammoth festival held in Germany to promote Bavarian culture and its greatest contributions to international cuisine — namely, sauerkraut, bratwurst, and Marzen beer. The former, however, is a tiny, little-known birthday celebration for the greatest writer ever brought forth from a rowhouse on Hollins Street — namely, Henry Louis “H. L.” Mencken. And I for one — and for many reasons — make it a point to partake in both annual events. The first, better known as “Mencken Day,” is held every year on or about September 12 (Mencken’s birthday) and attracts a hundred or so scholars, enthusiasts, idolaters, and other ignoramuses, who gather in an upstairs room at the Enoch Pratt Library to read from works by, and discuss in minute detail the life of, the so-called “Sage of Baltimore.” For example, a recent program boasted a speaker who “has done heroic work in exhuming the [Pratt’s] entombed collection” of sheet music favored by Mencken and other amateur musicians conjoined in the weekly Saturday Night Club gathering. A Sermon on the Mount this ain’t. But, as card-carrying members of The Mencken Society, my father and I have delighted in such pecksniffery off and on for nearly 20 years. Late in life (and, later, in the afterlife), Mencken revitalized his flagging reputation by publishing half a dozen autobiographical works, the most (positively) popular being the nostalgic three-volume Days collection, in which Mencken chronicled his life from infancy to the start of his career as a journalist. They were rollicking reads and solidified his reputation as one of the most influential American writers of the first half of the 20th century. Other books, published posthumously, including several memoirs and his controversial diary, spotlighted specific aspects of his career, public persona, and personal life. So it seems hard to believe that the unabashedly self-promoting author could have more to say about himself — Mencken estimated he had published 10 million words in his lifetime — but apparently he did. 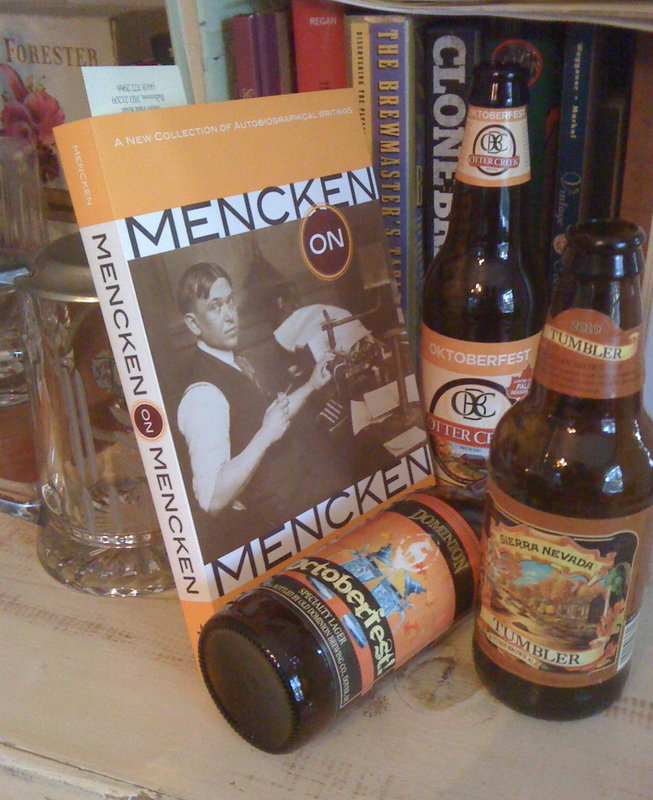 The 44 pieces in Mencken on Mencken, gathered and edited by S.T. Joshi, include snippets of reportage and reflection covering facets of Mencken’s life and thought that were only hinted at or missing from his other self-histories. Written over a period of 50 years, for such popular periodicals as the New Yorker, Esquire, Vanity Fair, and the Chicago Tribune, none has ever appeared in book form. The topics cover some familiar territory but are no less entertaining — incidents from everyday life, accounts of friends and colleagues, ruminations on his careers as author, journalist, and editor, his views on politics and religion, and several travelogues from trips abroad. It’s the latter category that’s proved most appealing, and one of my favorites seems fitting to mention here now. Called “The Beeriad,” and published in 1913, it’s a rousing account of Mencken’s encounters with the food, brews, and barmaids of Munich. Fueled by pride in his German heritage, and guided by his self-proclaimed “capacity for gusto,” Mencken let few details pass by his hungry eyes — from the genius of sauerkraut (“a perfect grass, embalmed to perfection”), to the quality of the native beers and beer halls (“the best beer in Munich is the Spatenbrau; the best place to get it is at the Hoftheater Cafe in the Residenzstrasse”), and the ideal means for a man to enjoy it all: “with the seidel of that incomparable brew tilted elegantly toward his face and his glad eyes smiling at Fraulein Sophie through the glass bottom.” It’s an outdated account and no longer (if ever) could serve as a useful guide to the city. But, in terms of the caliber of the prose and acerbity of the wit, here as elsewhere in the book, it’s certainly vintage Mencken. 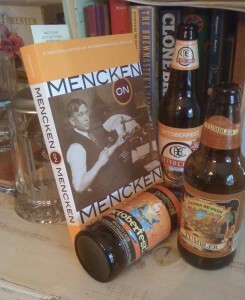 Now, it would seem improper not to imbibe a little while perusing (and carousing with) Mencken. And what better beverage than what he termed “the best beer in Christendom”: the Marzen, the kind commonly served to the millions of revelers who gather in Munich to celebrate Oktoberfest, which begins (albeit confusingly) on September 18 and runs to early October. The beer is named for March, the month in which it was traditionally brewed. Long before refrigeration, brewers in Germany would make one last vatful before summer’s heat made beer-making impossible. They brewed this last-ditch batch in early spring and lagered, or stored, it underground in ice cellars or caves until September or early October, when brewing could resume. It’s this prolonged period in “za cooler” that creates its characteristic rich, caramel sweetness, signature coppery color, and subtle hop aroma. Oktoberfest is one of my favorite holidays for beer-picking, for several reasons. First, there are always so many choices. Nearly every brewery, on both sides of the Big Pond, rolls out its own version. Second, Oktoberfests are great all-around, very drinkable beers that provide a nice transition from the lighter tonics of summer to winter’s heartier brews. Best of all, they go with many different foods, from grilled burgers and sausages to pizza and fried chicken. This year, I sipped on a mix of new (or new-to-me) seasonals, including some model Marzens and a few non-standard autumn ales, while supping on a simple dinner of pan-seared bratwurst, served with either broiled potato wedges and asparagus, or pasta with sauteed zucchini and tomato sauce. All six performed very well at the table, in different ways. Paulaner Oktoberfest-Märzen, from Paulaner Salvator Thomasbrau AG, is a staunch traditionalist. Although lighter in color than some Oktoberfests, its roasted malt aroma, creamy-soft, full body, and nutty sweetness make it a classic. It’s a very approachable, very versatile amber lager that said “jah!” to the salty, crsipy veggies. Dominion Octoberfest, Old Dominion Brewing. This is as close to a traditional Marzen as you can get this side of Bavaria. Smooth and malty, slightly sweet with a hint of hops, it was delicious with the smoky, spicy meat and wunderbar with honey mustard. Octoberfest, Samuel Adams. This seasonal deliciously illustrates the possibilities to be had when you combine Old World charm and Yankee ingenuity. Dark orange in color, and giving off a robust malty fragrance, this Marzen is slightly hoppier and has a spicy bite to match the zesty tomato sauce. Prosit!, Clipper City Brewing Company. The brewery calls this an “Imperial Oktoberfest Lager,” which means it’s richer and more potent than its Bavarian brethren. Truth is, despite the skull-and-crossbones label, and 9.0% alcohol content, this is a sweet, creamy, good-natured Marzen that loves a bratwurst. Oktoberfest, Otter Creek Brewing. With its ruddy color and bold use of hops, this beer is technically an amber ale. But I think its slightly pronounced bitterness complements (and compliments) the expected malt sweetness, creating a crisp, welcome alternative to the common seasonal. Tumbler Autumn Brown Ale, Sierra Nevada Brewing Co. This is a nut brown ale — emphasis on the “nut” — with an earthy aroma and a dry, mildly bitter flavor that suited the acidic asparagus. Yet it’s sweet (there are hints of burnt caramel and roast coffee) and rich enough to serve as a stand-in at any Oktoberfest offering. As always, tell us what you think. Have you ever been to Oktoberfest or “Mencken Day”? Are there other autumn seasonals that you think everyone should try? Let us know by leaving a comment below. Originally published September 13, 2010. Next post: Apples, Pumpkins, and Stouts — Oh My!